NO MATTER HOW HARD YOU TRY , YOU CAN’T TAKE IT WITH YOU. “Now godliness with contentment is great gain. 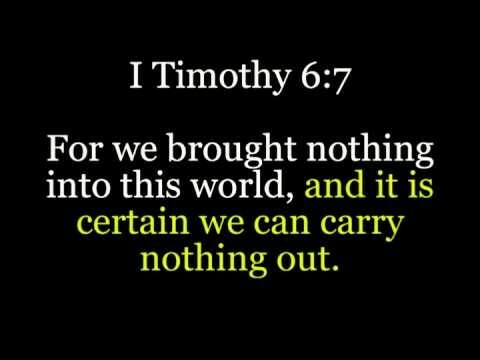 For we brought nothing into this world, and it is certain we can carry nothing out. And having food and clothing, with these we shall be content. But those who desire to be rich fall into temptation and a snare, and into many foolish and harmful lusts which drown men in destruction and perdition. For the love of money is a root of all kinds of evil, for which some have strayed from the faith in their greediness, and pierced themselves through with many sorrows”. (1 Timothy 6:6‭-‬10 NKJV). You will know of Steve Jobs, CEO and maker of iPad…iPhone etc. Sent with Smiles, Affection and Love ! !